Credit cards haven’t had a makeover in years, but all that changed with the introduction of EMV (Europay, MasterCard, and Visa) technology. EMV offers a much more secure shopping experience in that every time the card is inserted into a chip-enabled checkout device, the purchase generates a unique transaction code that cannot be used again. There is an important difference between chip-and-PIN and chip-and-signature transactions, both of which are offered with EMV. Most of us will continue to have to sign for purchases with our chip cards, as memorizing a PIN for your purchases, the other option, isn’t very popular yet in the US. Since most of Europe requires you to have a PIN with your chip-enabled card, however, it’s wise to have at least one in your wallet for international travel. Let’s take a look at some of the top chip-and-PIN credit cards here in the United States (none of which have any foreign transaction fees! ), or skip ahead to the best chip-and-signature cards. With an unlimited 2X miles per dollar on every purchase, there’s no end to the free travel you can earn with the Barclaycard Arrival® Plus World Elite Mastercard® (see rates and fees). You can apply for the Barclaycard Arrival® Plus World Elite Mastercard® credit card here. This card offers the same low ongoing APR on purchases, balance transfers, and cash advances, and charges no foreign transaction fees on purchases in foreign currencies. See Barclaycard Ring® Mastercard® rates and fees. Apply for the Barclaycard Ring® Mastercard® here. With no limit to the points you can earn and no expiration dates, this is a fairly flexible card with no annual fee. You’ll earn unlimited 1.5% cash back on all purchases, or 2% cash back if you’re a PenFed Honors Advantage Member. Apply for the PenFed Power Cash Rewards card here. This card allows users to continue using their signature, but also has the option to set a PIN for those international purchases. No annual or transaction fees make this card a popular choice for travelers, especially since rewards can be redeemed with no blackout dates. Apply for the BankAmericard Travel Rewards Card here. This card is invite-only, so look for the offer to arrive in your mail. With Club Cash access, complimentary airport lounge admission, superior concierge service, and discounts on all kinds of travel, it’s a fantastic option for the discerning traveler. Learn more at the Diners Club website. Loyal guests of the Wyndham hotel family will love that this card offers perks for stays, requires no annual fee, and gives frequent bonus offers for promotional purchase periods. Cardholders have over 25,000 Wyndham properties worldwide to stay at and earn points, including Wingate, Ramada, and others. Get more info on this card here. Here’s another Barclays credit card for those who like to save money on travel! Thanks to its partnership with Priceline, super-users of the discount site can get an additional 10% on the value of points when they redeem them for Priceline.com purchases. Learn more about this Visa card here. If you’re keen on traveling to someplace warm, a trip to Hawaii may be in your future! Consider getting more miles from your trip with a chip-and-PIN card from Hawaiian Airlines. This card features the same perks as the Barclays travel cards, plus extra incentives for those who visit the islands frequently. Apply for this MasterCard here. This card is a decent cash-back option for those who don’t want to pay an annual fee and need flexibility for their loyalty rewards. No penalty APR and unlimited cash-back earning make it an attractive chip-and-PIN choice for those with good to excellent credit. 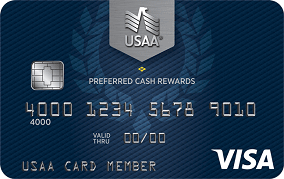 If you are an eligible USAA member (or want to be), you can sign up for this card here. You don’t only have to shop at Sam’s Club to take advantage of this card’s perks! Get 5% back on gas for the first $6,000 in purchases a year, as well as 3% on dining and travel. Rewards are capped at $5,000 per year, but there is no annual fee for the card. Learn more about this and the business version of the card at the Sam’s Club website. If you need an American Express card with chip-and-PIN technology, you’ll find your options to be pretty limited. This card offers it, although you’ll need to specifically enable the option. It also gives you all the American Express benefits cardholders are entitled to, in addition to no annual fee. Get more info on the card at the U.S. Bank website. Here’s another Wells Fargo product with no annual fee. Those who use the services of a Wells Fargo Advisor are eligible. Earn modest rewards and get access to exclusive VISA VIP travel perks, including their Luxury Hotel Collection, Visa Signature Concierge Service, and VIP access to events. Learn more here. Chip-and-Signature is still the prevailing technology among credit cards, especially for those based in the US. Until consumers get accustomed to skipping the swipe and become more familiar with the convenience and security of chip cards, expect these cards to be among the most likely to be offered by your bank. These cards offer excellent customer service, travel-friendly perk packages, and no foreign transaction fees! With TSA-lines, passport updates, hotel reservations, and flight changes to worry about, you’ll need peace of mind that your credit card has your back. Many travelers see their card as an ally in their adventures. They should be able to depend on it, not only for purchasing power, but as a lifeline to customer service teams that can help them troubleshoot any travel glitches that may arise during their trip. While foreign transaction fees may allow global travelers to be able to shop wherever they go, they are not something most cardholders should settle for paying. With all the competition among chip-and-PIN and chip-and-signature card issuers, most will be working hard to get your business — this includes skipping the foreign transaction fees altogether. If your bank insists you pay for the privilege of shopping where your wanderlust takes you, it may be time to consider an account with a more customer-minded issuer.